No matter what circumstances you’re in, increasing the value of your clinic should be one of your primary goals. Scenario 1: You’re looking to sell your clinic in the next 2-5 years. Therefore, you can use the following information to position your clinic as 'the place' to buy for potential prospects. Scenario 2: You might not want to sell now but one day in the future it could be on the agenda. Think of your clinic like owning a house. If you upgrade your kitchen, your house will be worth more money when you decide to sell later. Same goes for your clinic. Therefore, you can use the following information as a checklist to make your business worth more each and every day. Scenario 3: You will need an exit strategy and it might be one you did not expect. Many business owners never think about their exit strategy; then somewhere down the track they are forced to sell due to health issues, divorces, relocation because their spouses job is moving, something happens to the partnership and the partner wants to buy you out, and the most common thing - your business is losing money. Therefore, you can use the following information to safeguard your unforeseen early retirement and be ready to face the challenges - no matter what they are! As you can see, one of these scenarios is bound to be before you at some stage in your professional lifetime. Therefore, increasing the value of your clinic should always be one of your primary goals. It’s certainly not rocket science. In fact, it’s much easier than you might think. 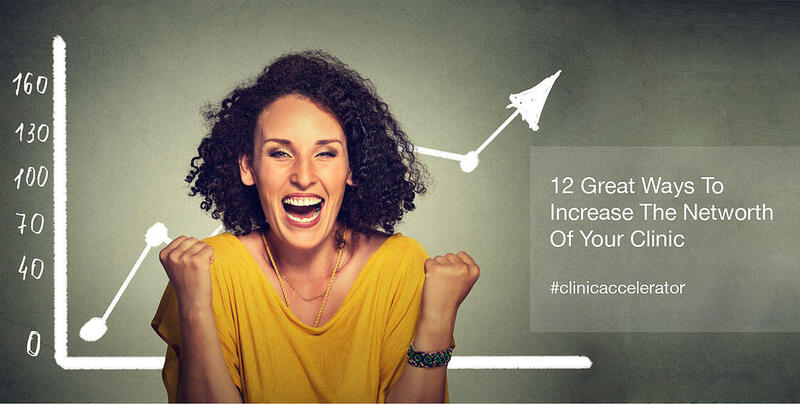 Ready to increase your clinic value? Over the past 10 years, I’ve had ample operational and acquisition experience with managing over 100 multi disciplinary centers and from working with countless clinic owners. I’ve got a thirst to learn marketing techniques and apply them to the treatment rooms, but one thing that matters most is building a company that matters. At the end of the day, this is the type of company that a buyer would want to buy if you ever decide to sell. For example, about 2 years ago Clinic Supplies Canada took the time to develop core values, and now everything we do is based on them – helping to drive up employee commitment, customer satisfaction, and 65% growth year after year. I believe that if you build a company that you, and everyone that works within it, loves, then you have the foundations for a business that someone else may want to buy one day. Of course, there are also a range of practical and financial factors that need to be considered too. So let’s go over those now. According to my friends at Breakthrough Physical Therapy Marketing, there are many different aspects that can increase the value of your clinic. These are also common things I share with my coaching clients, so I've laid these out below with my own explanations. EBITDA is a fancy accounting term that stands for Earnings Before Interest, Taxes, Depreciation and Amortization. It’s basically the profitability of your business. “It kind of aggregates and summarizes an entire profit or loss statement into a single factor,” says Mark Dietrich, as quoted on Ambulatory Advisor. Calculating your EBITDA is the best place to get started in understanding the value of your clinic. Read more about EBITDA calculations here. The multiple is your revenue/ profit multiplied to represent a saleable figure. Smaller practices may have a 2X multiple, whereas larger practices or a chain of clinics may have a much higher multiple 6X+. More recently I have seen as high as 8X. 3. Are you sticking around? If you’re the owner and intend to leave the practice, this reduces the value of your business, especially if you’ve been handling a large portion of the patient load yourself. Whereas, if you intend to stay, well, naturally value remains a little higher. The other thing is you can put in a ‘stay-on’ clause - meaning you will stay on working in the business during a set transition period to ensure efficient handover and steady profitability for the new owner. If you have one location compared to 10, what would the outcome naturally be? Yep, 10 locations is clearly going to yield a higher sale value. So at different points along your journey, you could assess whether it's viable to expand into new locations. Then there’s your actual location to factor in. Is it in a great position? A high traffic area? Does it have easy parking? How is your outdoor sineage? Do you have non competes in the same building? Have you negotiated a long lease? The actual location of your clinic and the associated location factors will determine sale value. I talk about doctor referrals and getting past the front desk gatekeeper a lot here on the CSC blog. It is a HUGE factor when it comes to value because it means you have one solid, reliable marketing platform established. One which does not require revenue to be invested, as many other marketing channels do. Clearly this is a great incentive for buyers. With 10 different doctor referral relationships established, the value of your clinic will be much higher than if you have 1 or none. Focus on winning back those doctor referrals and implementing systems to gain more of them. It not only benefits you now but positions your business well over the long term. It goes without saying that to run a tight, efficient business, you need to have all your monthly financials on track and in tip top shape. But in particular, keep your billing and money owed on track - less than 30 days. If you have a lot of money owed that’s old and aged, say 90-120 days or more, then your sales value rapidly decreases. The greater your reputation, the higher the value. As you develop your business, you need to be actively seeking patient feedback, gathering positive Google reviews, and focusing on the delivery of exceptional customer service. High staff turnover lowers the value of your practice, whereas low staff turnover increases it. Low staff turnover and long term staff commitment is a great indicator of solidified core values, core values that employees want to be engaged in. Focus on creating clear core values because having them is also a great way to ensure you attract top healthcare professionals to your team in the first place. The longer your clinic has been in business, the more established it is, therefore, the higher the value. If your clinic can show a continuous increasing trend in profitability, then the value of your clinic will be higher. On the other hand, if it’s starting to crash and burn, well, you can expect a lower number. Always assess your financials and aim for those steady increases each month. It doesn't have to be a huge lift in revenue each month, as long as it is increasing and not decreasing. If you're not achieving increases, you need to focus on internal and external marketing strategies, along with your systems for doing things. Identify what's not working and fix it. Or if you struggle to figure it all out, get help to do it. Is there opportunity in your surrounding area for the clinic to grow? Can the clinic itself grow into a multidisciplinary clinic? Can you capture more of the market by offering a higher variety of services? You need to continually explore different avenues to grow internally and externally because everything you do increases the value of your clinic. As you can see, none of this stuff is really rocket science. It’s about putting yourself in the buyer's shoes and focusing on creating a great business, which is what you should want for yourself anyway! Need help to grow your clinic? I work one-on-one with clinic owners to help keep you on track and accountable with all of this stuff. One of our main objectives when working together is to position your business to sell. 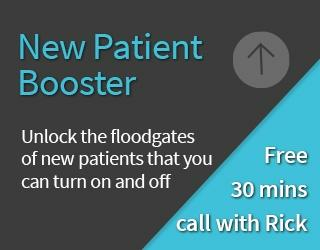 If you're struggling to grow your business and stay on track with increasing growth, check out my New Patient Booster Program, and let's chat about how I can help you.